Saturday the 18th of april sports complex 333 with Latvian and Baltic Championships will be unveiled Latvian karting season. In front of us we expect exciting season. This year, all the stages of the Latvian championship will take place in Latvia, in total 5 races. 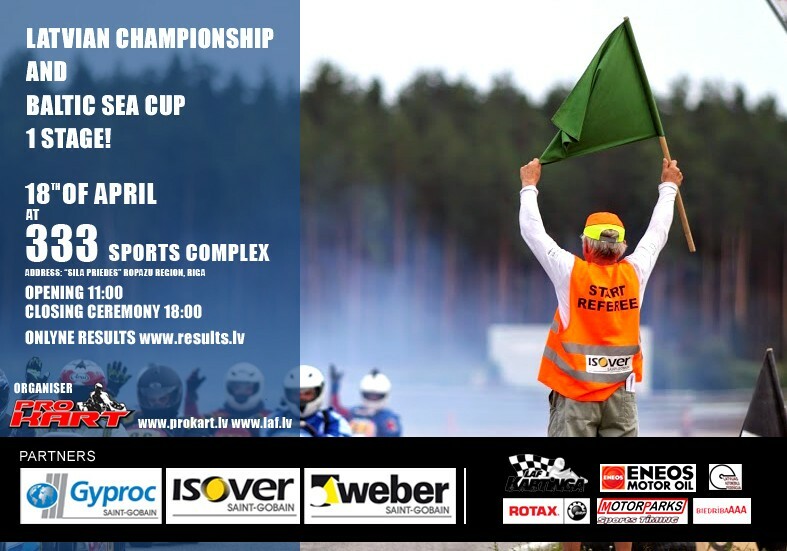 Pro-Kart Cup will take place also in five stages, one of which will be played together with the Latvian Championship. This means that this year will take place 9 karting competitions in Latvia, including three Rotax Baltic Cup stages, one stage of the Baltic championship KZ2 class. Like every year, there is some small change in the conduct of the race. The most significant of these are that own transponder is needed, of course, it is possible to rent it for the race, but it increases the competition participation fee. For that the athletes receive better service, such as timekeeping services on Friday. All race results to be found online here www.results.lv. LAF Karting Commission has adopted a support program for athletes under 15 years of age who will compete this year for the first time in Latvian Championship, LAF athlete's license will be free of charge. Athletes who qualify for this assistance must submit to the LAF Karting Commission application and conclude an agreement on the received support. LAF Karting Commission intends to co-financing for those MicroMax and MiniMax athletes who plan to participate in this year's MicroMax & MiniMax Euro-Final 2015 race in August. These athletes must submit LAF Karting Commission an application for the purposes for which it is planned to spend these funds. LAF Presidium has allocated funds for athletes who plan to participate in the FIA Academy. In this case, athletes must submit LAF Karting Commission their projects. Ja nebūtu tādu pilotu, kā Garkaklis un Lapiņš baltijas kartings būtu tikai garlaicīga statistika. Šitie veči piedod šim spoprtam emocijas!!! Par pirmo braucienu piekrītu, bet 2. brauciens nebij paraugcīņa! 2. brauciens DD2 bij viens liels slaktiņš! Piekrītu !!!! Uz naža asmens !!!! Vismaz džeki uztaisīja šovu . Tā nav daiļslidošana !!! Vēl patika Kristapa Gasparoviča perfektais dacnis .,Tiešām, puisim "cepurei nost" . Labais .!!!!! Smuki !!!! Vai ta nu bij tik traki? Villojās jau tikai pirmais trijnieks. Kur ir sacensību programma? Cikos sākās pusfināli/fināli un kādā secībā? Te pat mājaslapā viss viss ir. "Pro-Kart kausa izcīņa šogad norisināsies arī piecos posmos, no kuriem viens tiks aizvadīts kopā ar Latvijas čempionātu"
Tas nozīmē to, ka būs viens posms, kur punkti finišējot ies gan prokartam, gan latvijas čempionātam? Ja tā, tad es nedomāju, ka tas ir pārāk prātīgi. ja tavs kartings salūzt un neesi spēīgs finišēt, vai paliec beigās, tad ne tikai prokartā audē punktus, bet arī latvijas čempionātā un esi sabojājis divas sacensības reizē.